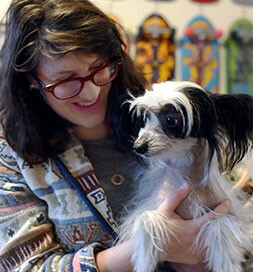 Ilana Pinto grew up around dogs in Canada — running dog sleds and spending ample time at the nearby dog park — but she never had her own. When she and Eric Pinto got married, she knew it was time. “I’m old enough to be married; I’m old enough to have a dog,” she told herself. Her husband recalls her persistence during their first year of marriage. “She was looking at the Petfinder app every day nonstop [asking] ‘What about this one? What about this one?’” But Eric wasn’t quite as ready for a dog and was actually allergic to certain kinds. However, after some research and more gentle nudges, Ilana finally wore him down. 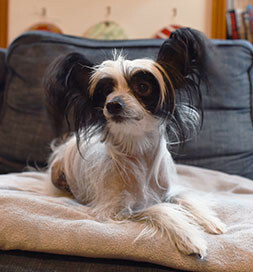 “I was like, ‘What about these Chinese Crested? They kind of look like 80s Japanese rock stars!’” she said. Eric agreed the breed would be a good fit, and after finding Pony on Petfinder, the couple adopted him on July 3, 2011 from Bluebell’s Rescue in Houston, Texas. The rescue even provided them a carrier, leash, toys, food and bowls, making the adoption process incredibly seamless. Pony — whose name is inspired by how he moves —soon became Ilana’s “little shadow” following her everywhere she went.